ABC started as an association of Kamba Christian men. In 1942, it was common practice to form associations like the Akamba union, Kikuyu Association Union, North Kavirondo in South Nyanza and so on. The association that later on birthed ABC was however different and unique because most of the unions set up at the time were self-help groups addressing social, economic and political problems but the Akamba Christian Union was admitting Christians only. The association was interdenominational bringing together Christians from various denominations such as AIM, Baptist, Salvation Army, Catholic, Anglican among others. Their aim right form the beginning was not political. The Christian Association and the political African Union did not work together or associate with each other. The Christian members that formed part of the Akamba Christian Union refused to engage in politics within their unions and therefore wrote to the municipal native affairs officer in Kenya’s Capital city, Nairobi, applying for a name change that would omit the term ‘union”. On the 14th of August 1943, the name was changed to Akamba Christian brotherhood (ACB). The association was originally meant to assist the needs of the various denominations where the members came from. This included financial resourcing to help in putting up buildings and supporting pastors and evangelists. Several committees were formed including the provincial committee, which comprised of 14 members at the time. The committee was purposely formed to provide leadership and management of the association, financial management, to take care of the welfare of leaders, to put together the association’s constitution, to prepare a register for the members and to hold regular meetings to discuss the affairs of the association. In the year 1944, the association was in a political and financial crisis. Financially they were unable to raise enough money to sustain the association and politically, the association was suspected of having a secret political nature. The political issue was resolved when the government lodged an investigation only to find that the association’s motives and activities were purely religious. In June 1944, the provincial committee met to discuss the financial struggles of the association and came up with the idea of passing around a “small box” where every member of ACB would put 20 cents during each and every meeting held by the association members. In the same meeting it was decided that women would also be allowed to register and become members of ACB, a privilege before then reserved for men. The women soon after joined in such large numbers that they became the majority members of the ACB. At this point in time, the committee also introduced an annual subscription of KES 2 per male and KES 1 per woman, on top of the registration fee of KES 5.20 per male and KES 2.70 per female. The leadership also introduced a system where each member had to give a free thanksgiving offering at the end of each year. These strategies served to strengthen the association’s financial coffers. The association had members not just from the Akamba community but from various tribes in Kenya for example Luos in South Nyanza. The Akamba clause in the ACB name had therefore been cause for incitement against ABC among the association’s members by the mainstream churches. This also led to excommunication in some cases. To effectively build up the financial coffers of the association so as to effectively administer functions associated with churches, it was important for ACB to establish itself as a national, not tribal, fully orbed church. Members of ACB had been denied positions in churches and lost jobs because of their membership in the association so the leadership thought it wise to set up an independent church. 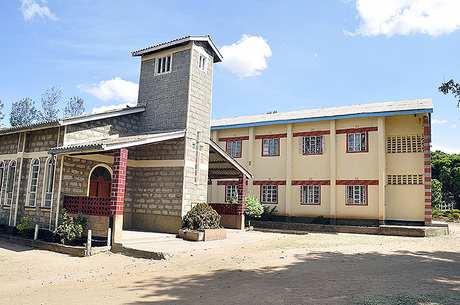 Today ABC has grown from an obscure fellowship in 1945 to becoming the home of over 150,000 men and women 861 congregations in East and Central Africa.